Keep It Real Friday, back at it again. After all that, Red Sox slugger David Ortiz broke out of his homerun drought on Wednesday night. It took Big Papi 130+ at bats and a subsequent benching to get off the mat, but I'm still concerned. The Red Sox have a 3-hole hitter batting .210, that is a reality. Sox Triple-A lifer, Jeff Bailey, has 2 homers with big club in 80 less at bats, that is a reality. Among every day players on this club, Ortiz is dead last in on-base percentage, that is a reality. The Sox are stacked with young minor league talent, all that can be used as trading chips to add a bat, which is a reality. The Yankees finally have Alex Rodriguez back in their lineup and Mark Teixeira is hitting again, that is a reality. The Yanks are closing fast and Tampa isn't to be snubbed out yet, that to is a reality. It needs to be said and not taken lightly: David Ortiz has about two or three weeks to find his stroke. If he can't, the Red Sox will be forced to play their hand and discuss other options. The Cleveland Indians are quickly falling out of contention if they haven't already (15-26). Their DH/Catcher Victor Martinez is hitting .400, just a suggestion. The Orioles are where they usually are by now, does veteran Aubrey Huff (7 homers, 33 RBI) become available? I love Big Papi, but I loved Nomar, Pedro, and Derek Lowe. If the Red Sox need to part ways or find another option, I'm more than willing at this rate and Red Sox Nation should be to. KEEP IT REAL! Finally, Thank You Carson Palmer. I redirect you to this story. I like my quarterbacks in charge. In charge of the huddle, in charge of the sideline, and in charge of demanding quality play from the guys around them. Carson Palmer taking shots at Chad Ochocinco is overdue but at least it's getting done. Chad Johnson is a joke, from his off the field antics to his on the field antics. Chad Johnson, Terrell Owens, and Plaxico Burress were and are great talents but I've got news for them. The days of the wide out who plays only on offense are on the way out, and fast. Super Bowl MVP, Santonio Holmes not only catches passes but also returns kicks and can run across the middle of the field. DeSean Jackson, the Eagles standout rookie receiver both catches passes and returns kicks. Hell, they wanted more than one of those guys drafting Missouri speedster Jeremy Maclin and guess what he has a highlight reel of kick returns to go off of. The Patriots top target? Wes Welker, of the kick returning, over the middle catching, and game breaking mold. Want more? The Chicago Bears made their defensive back/kick returner Devin Hester a wide out, why? To get more versatility out of him. If Chad, Terrell, and Plax want to have an impact playing the way they play, go to practice, stay out of trouble, and for the last time: SHUT UP! KEEP IT REAL! Mine That Bird, needs more love. I'm going to show it to him. 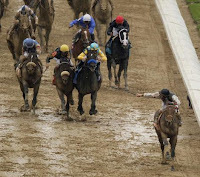 Let me take a swipe at Calvin Borel, the jockey that rode Mine That Bird to victory in the Kentucky Derby then tossed him to the side for the Preakness. It's called horse racing, not jockey racing. All due respect but outside of die hard horse racing enthusiasts who will remember the name "Calvin Borel," no one. Did you remember that he rode Street Sense to the same victory just two years ago? No. I don't care if Rachel Alexandra is the best horse since Cigar, you don't toss a 50-1 odds horse who rocked Churchill Downs for some cash, easy move guy. Mine That Bird popped off as runner-up at Pimlico, you may have been able to take that race and head to Belmont as a Triple-Crown contender? Choose history over cash next time buddy. Now for Mike Smith, the jockey that road Bird to the Preakness runner-up. Smith is ditching Mine That Bird for another horse and another race! Mike Smith, you are Mr. Irrelevant in my book. I'm don't condone beating females, but I want Mine That Bird to destroy Rachel Alexandra in Belmont, put a stamp on it! KEEP IT REAL! Kobe Doing Work, riiiiight. The much ballyhooed Spike Lee documentary was the most boring thing in EVER. I mean it, next to watching paint dry and grass grow, Kobe Doing Work is right there. The documentary seemed as if it went on forever, Kobe Bryant doing voice overs on an entire game from last season, yep that sounds about as boring as it was. 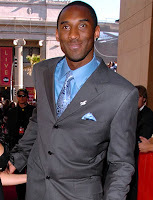 Two things stood out most: (1) What LeBron seems to do with a wink and a smile, is impossible for Kobe to do. Between his legal issues several years back, the feuding with Phil Jackson and Shaq, people don't buy Kobe as a "good guy." No one attempts to get people to like him more than it seems like Kobe does. If your a great guy you don't need to try and convince people you are, it's overkill. (2) His teammates don't attach themselves to his intensity, at least not like they do with Kevin Garnett. With Garnett, everyone around him gets up for the games they get tough like KG does and they are inspired by him, with Kobe it's just different. Kobe Doing Work may have been meant to show us how great Kobe is, but it was just boring. I want to see KG Doing Work, KEEP IT REAL! I really feel for the Nuggets and Magic. Sure Orlando stole game 1 from the Cavs and yes the Nuggets showed they can play with L.A., but this is the NBA and EVERYONE wants Kobe v. LeBron, just like they wanted Boston v. L.A. last season. I'm not saying it's fixed but come on, how many more NIKE commercials and Vitamin Water commercials need to be played on television before someone says "I get it, you want Kobe v. LeBron and you won't stop hyping it." If the NBA wants to showcase to the world they'll do it with LeBron and Kobe, so as for Orlando and Denver, sorry. 24 v. 23 is happening, the sooner you get used to it the better you'll be. KEEP IT REAL!